DCU Students’ Union joined the National Housing Protest calling for fair rent and adequate housing on Wednesday October 3, 2018. Protesters from DCU rallied together with students from third level institutions across the country outside the Garden of Remembrance at 12pm today. Placards held high above the crowd displayed the sentiment of the protestors. Phrases such as ‘Save Homeless Students’ and ‘People are dying, young people are leaving, the boom is not back’ were used. Students joined trade unions, charities, housing activists and community organisations to march for an increase in fair, affordable and adequate housing. President of the USI, Síona Cahill, said “there are well over 6000 students on this street today”, all in support of the ‘Raise the Roof’ Campaign. She continued to describe the crisis as “the social justice issue of our generation” and called upon the government to declare a national emergency for accommodation. President of the Irish Congress of Trade Unions, Sheila Nunan said “rents are too high and incomes are too low” and called on the government to take action to “protect its citizens”. A shortage in purpose-built student accommodation and a lack of rent pressure zones for student accommodation means that students are left extremely vulnerable within the housing crisis. DCU student and young Sinn Féin representative, Cormac Flynn, spoke about his own situation saying, “If the government do not provide more purpose-built accommodation, then student’s from outside of the city will not have access to third level” and ultimately the country will suffer. 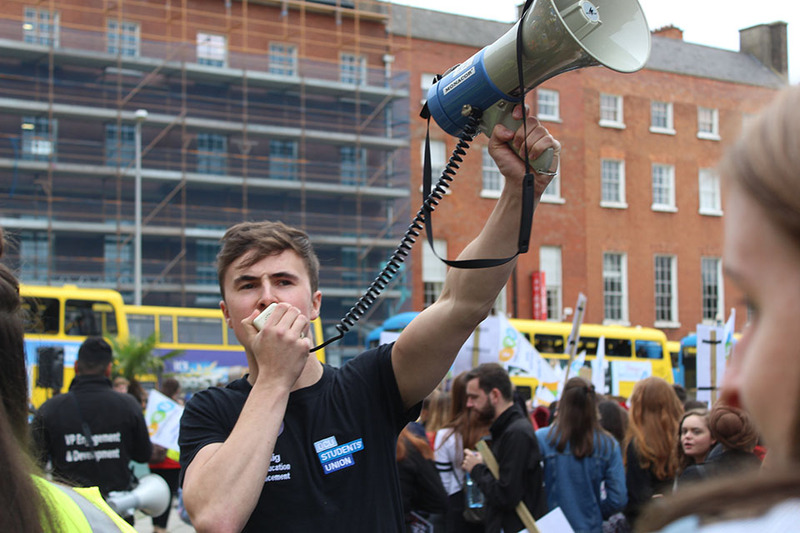 For DCU in particular, the 27% increase in rent at Shanowen Square, a student accommodation complex, sparked a movement among students earlier this year. The effect of the accommodation crisis on students is clear according to Vice President for Academic Affairs at DCU SU, Callaghan Commons. The protest saw people spilling into Dawson Street, gathering unified over an issue that has sparked momentum in students nationwide.